The night monkeys, also known as owl monkeys or douroucoulis, are assigned to the genus Aotus, the only truly nocturnal monkeys. Though Aotus means “without ears,” they possess tiny hard-to-see external ears. They are found in forests of Central and South America, from Panama south to Paraguay and northern Argentina. Debate still exists on the number of species. The Panamanian Night Monkey ranges from Panama to northwest Colombia. They are small, with the males weighing around 31 ounces and females slightly more. The fur on the back is gray-brown to reddish-brown with yellowish belly fur. The back of the hands and feet have black or dark brown fur. Unlike many nocturnal animals, their eyes do not have the light-reflecting surface (tapetum lucidum), so they don’t have the “eyeshine” typical of many night-active creatures. 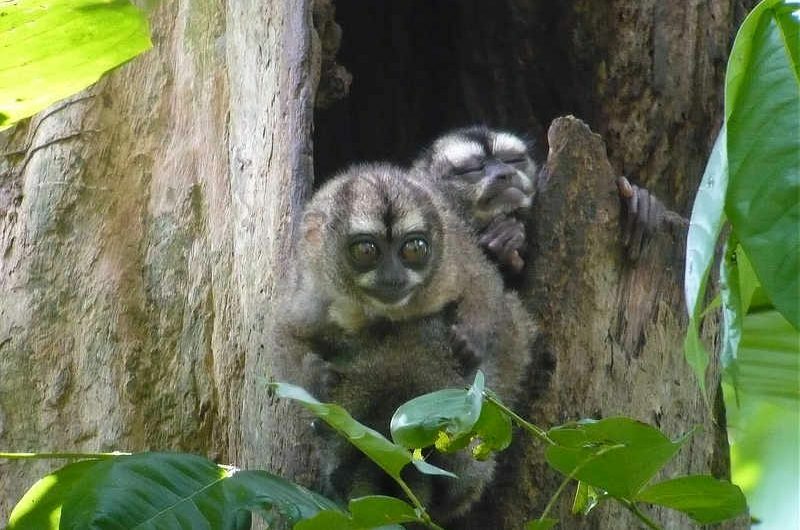 The Panamanian Night Monkey lives in small territorial groups from two and six, consisting of a bonded adult pair and young of varying ages. One infant (occasionally twins) is born each year, and the male carries and tends to the infant after the first few weeks. Night monkeys walk on all four legs, but they are capable of leaping or running when necessary. Their diet consists of a variety of foods. In a study on Barro Colorado Island, diet was found to consist of 65% fruits, 30% leaves and 5% insects. You can often find a family of Panamanian Night Monkeys in their “day roosting tree” around the trails of the Canopy Family lodges.